Want to know more about conservation research & theses in Belgium? This event focuses on research in conservation from Belgium. It aims to gather heritage professionals & students around short presentations and interactive sessions about recent research and theses. Conservation Talks is an opportunity for conservators to get in touch, exchange and enrich their research/practice; and for students and young graduates to make a first step in the professional world and get a constructive input about their project. The communication will be in English, beginners are welcome! > Registration deadline: November 20, 2018 / Limited number of participants – students and heritage professionals. 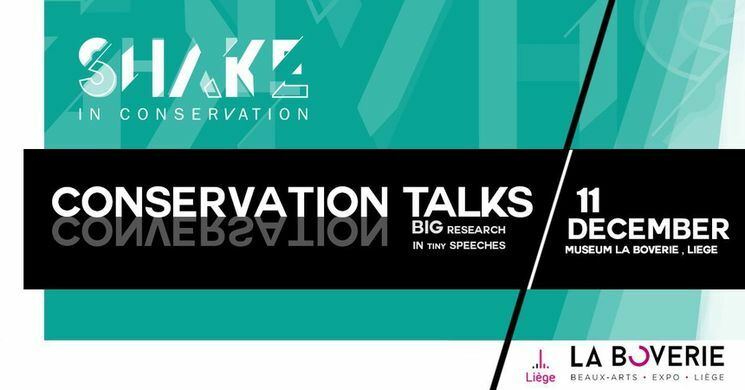 Conservation Talks is organised by SHAKE in Conservation with the support of La Boverie and the Echevinat de la Culture de la Ville de Liège and the collaboration of the conservation departments of ENSAV La Cambre, ESA Saint-Luc Liège and UAntwerpen. Consultez la page de l’événement via le lien suivant.